Why I chose sports to write about? In a word, horses. But since you asked for a thousand words, I’ll elaborate. I was one of those horse-crazy girls who never recovered from the fever. The bug bit early, bit hard and bit forever, causing a life-long obsession. And my theory about obsessions is they, like noses, never stop growing. I’m a perfect example: I bought my first horse at age 17 and by the time I was 40, owned six. If you’ve read either of my books, Horse of a Different Killer or Chestnut Mare, Beware, you’ll notice that my protagonist Nattie Gold is equally obsessed with the four legged, velvet-muzzled creatures. Every aspiring writer is told the old saw, “write what you know.” For a good reason. It works. Writing about horses and horse showing is like coming home. I sit down at my computer, close my eyes and remember the wonder and glory every time I get near a horse. Words ripple up from some place, forming sentences that surprise me. I think the stuff I’ve written about Nattie riding her horse Brenda Starr is some of the strongest writing I’ve ever done. It’s certainly the part I enjoy most. For me, writing has always made me feel like I’m living life twice. To be able to ride that same ride not once, but twice is a pleasure akin to eating fudge brownie ice cream with caloric impunity. He was convinced there was an untapped niche for that in the mystery world. He couldn’t have been any righter than if he’d said the sky was blue. It was the proverbial eureka call to me as a writer: Horses and females, a natural combination. Because I was so close to it, it had completely slipped over me. Go to a riding stable and see who’s taking lessons, mucking stalls, drawing horse heads with hearts around them. Those are pigtails flying out from beneath all those black velvet hunt caps. They’re all girls. You might find one or two boys if you look hard enough, but not too often. A female equine crime writer, it seems not only natural, but the way it should be. Who better to understand the bond between horse and woman, than a horse-crazed female? This is not to say my books are solely for female readers. Men read them too—and given the reviews by male critics, like them. Some of the best reviews I’ve gotten (The Los Angeles Times, The Toronto Star, The Philadelphia Inquirer, Kirkus, among others) were written by male critics. Aside from my passion for horses and my gender, my agent couldn’t have been more right for another reason: the horse show world is a natural for mysteries. Anytime you get a collection of people with more money than sense, you’ve got tension. And tension is the cornerstone of fiction, any kind of fiction. In mysteries, it’s the gold mine. At its best, the sports world is one of power and grace and inspiration; all good fodder for the fiction mill. At its worst, it’s a repugnant place littered with truly despicable people committing despicable acts—even better fodder for the fiction mill. Look at the newspapers: ice skaters smashing other ice skaters’ knees, little girl gymnasts starving themselves to death, young sought-after basketball stars who happen to be rapists. 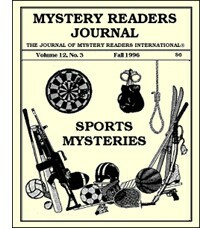 The stuff of murder mysteries, it’s all there in the sports sections. Horse showing is no different. And yes, I do believe it is a sport. My horse is as much an athlete as my hero, Muggsy Bogues, and deserves a medal of valor for carting me around over a course of eight fences. As for the riders, I’ll stack Olympian Anne Kursinki’s magical athleticism right up there with Michael Jordan’s any day. Along with the best, we’ve got the worst in our sport. Plenty of it. In fact, sometimes it seems we’ve got more than our share of pond scum, some of whom are now serving time in jail for having their horses killed for insurance money. If the sports world is a fertile field for a fiction writer then I am a happy farmer. In Horse of a Different Killer, Nattie tackles that very issue of murdered horses and insurance fraud. I wrote the book a year before the twenty-three thugs were indicted in Chicago for doing the exact same thing. I’m no psychic, just a good listener. Stories of killing horses for insurance money have been going around for years. Up until the indictment, it’s been horse showing’s dirty little secret. In my second book, Chestnut Mare, Beware, Nattie looks into the death of a young woman who went on a trail ride in the horsey town of Middleburg, Virginia, and never came back. Her family called it murder, the police called it an accident. This is based on a true story. However, I don’t pretend to know what really happened on that trail ride. In fact, I purposely didn’t do any research or interviewing. I used the idea as a skeleton and filled in the flesh of the story my imagination. There are downsides to writing about the sport in which you participate. A few months ago I got a phone call from my trainer, who’d just gotten back from a big horse show in North Carolina where my books are set. After the publication of Horse of a Different Killer, I’d apparently become persona non grata in the Tar Heel state. I guess I stepped on a few too many toes in my first book with my representation of the horse show crowd as a bunch of overly rich and underly occupied people. So much for writing about the sports world! Although modern baseball certainly doesn’t lack for intrigues and villains, I set my Mickey Rawlings baseball mysteries during the early years of this century, when the grass was real, spike wounds were salved with tobacco juice, and the arena of interest was the playing field, not the boardroom. My personal journey backward through baseball time began in 1963, when I went to see my first major league game at the Polo Grounds (home to the New York Mets before Shea was built). The Mets of those years (and of recent years, come to think of it) were abysmal, a collection of old-timers long past their primes and youngsters who were never going to have primes. Among those old-timers, though, were some former Brooklyn Dodger stars who were brought back to New York for one last hurrah. Among them: Duke Snider, Gil Hodges, and manager Casey Stengel. Reading through the ’63 Mets yearbook (which I still have), I became fascinated by these old stars and wanted to learn more about them. I talked to fans who had seen them play, read biographies and team histories, and collected bubble gum cards. Soon I was going further back in time, and learning about other players, teams, and long-defunct leagues. As I grew older, I was determined to become somehow a participant in the game I loved. When my playing skills deteriorated (soon after my rookie season in Little League), I looked for other options. When I was in high school, I coached Little League and Babe Ruth League teams, thinking I might eventually get Walt Alston’s managing job (the Dodgers opted for Tommy LaSorda instead). I corresponded with the librarian at the Baseball Hall of Fame about job opportunities as a baseball historian or librarian; he told me there was no such thing as a professional baseball historian and he was the world’s only baseball librarian. After high school, I went to Florida to attend professional umpire school (where I set a record for thickest eyeglasses). My umpiring career soon went the way of my playing career, but I did get to umpire an old-timers game and talk with the players; their stories of what it was really like to play major league ball in the old days have stayed with me. Choosing baseball history as the setting for my mysteries came naturally for me. Creating the sleuth was a bit more difficult. Instead of making him a sports writer or manager, I wanted to make him a ballplayer because I thought it would result in a more intimate feel for the game. This choice of protagonist created the problem of how to make a baseball player a plausible amateur detective (if you’ve ever seen a player give an interview, you might wonder how he can find his way to the ballpark, much less solve a murder). Part of the plausibility issue was resolved by the era in which the books are set. Before 1920, players relied more heavily on strategy (“inside baseball”) to win games and played “smart.” I also decided to make my protagonist a marginal player with little natural talent (like they say, write what you know). Instead he uses savvy and guts, and has to give everything he has simply to remain on a big league roster. Naming him after my baseball glove, I finally created utility infielder Mickey Rawlings. He has two goals: to bat .250 and to play someday in a World Series game. To compensate for his lack of natural ability, he watches the opposition to see if he can lay down a bunt, take an extra base on a weak-armed outfielder, or steal their signs. He checks the field to see how ground balls will play on it and whether or not the groundskeeper has doctored the foul lines. Mickey is determined to stay in the big leagues and scraps and fights his way to do so, even though he doesn’t remain with any one team for very long. His baseball qualities of observation, strategic thinking, and tenacity are the same ones that he brings to use when investigating murder. The history of the era in which Mickey plays is rich with material for a series of mysteries. There were ferocious players like Ty Cobb, John McGraw, and Carl Mays, who literally played for blood. Most owners were of the robber baron mold, and generally more ruthless than any today (possibly excepting George Steinbrenner and Marge Schott). There were wars between leagues, first between the National and the upstart American, then with the outlaw Federal League. Gambling tainted the game even before the 1919 World Series, and there were players involved in everything from a car theft ring to bootlegging. Throughout the series, I rely heavily on historical characters and events. Mickey’s first adventure, Murder at Fenway Park, is set in 1912, when Fenway Park was new, the big news was the sinking of the Titanic, and the Red Sox were on their way to a World’s Championship (really – I didn’t make that part up). The story is based on a real attempt to fix the 1910 batting championship. Among the players appearing in the novel are Ty Cobb, who almost lost that title, and Hal Chase, a slick-fielding first baseman who was as crooked as he was talented. In my second novel, Murder at Ebbets Field, Mickey, who has few vices but chief among them is a fondness for nickelodeons, actually gets to be in a movie. He and Casey Stengel make cameos in a production at the Vitagraph studio in Brooklyn, and Mickey becomes involved with one of the actresses. Many players of the time (1914) did appear in movies and vaudeville. Also figuring into the plot of this book is the long-running Dodgers-Giants feud and the war with the Federal League. American social history is as important to the series as baseball history. The period from 1910 to 1930 was one of drastic changes, starting in the age of innocence and proceeding through the Great War, the Red Scare of 1919-20, race riots and the reemergence of the Ku Klux Klan, Prohibition, the roaring twenties, and the Depression. This changing backdrop helps keep the series fresh and provides Mickey opportunities to evolve and grow. Murder at Wrigley Field is set in 1918 Chicago, while the Secretary of War is trying to shut down major league baseball and a rabid anti-German hysteria sweeps the country. The fourth book, Hunting a Detroit Tiger (coming in April 1997) is set in the wake of the Red Scare and involves ballplayers trying to form a union in the face of efforts to quash the American labor movement. As we enter the 1920s, Mickey and I have to deal with changes to the game itself. A modification in the manufacturing process has resulted in a livelier baseball, the spitball has been banned, and Babe Ruth is revolutionizing the game with his home runs. And, in the wake of the Black Sox scandal, baseball is about to appoint its first commissioner. Fortunately, we’re still a long way from being faced with such atrocities as the designated hitter rule and artificial turf. I hope this series will be a long one, partly because I have numerous ideas for future stories (many of which have been suggested by readers) and partly because it allows me to achieve a long-standing ambition: not of being a writer, but of being a baseball player. By writing in the first person, I get to say things like “I hit a home run off Ed Walsh in Fenway Park” and “Stengel’s throw was off the mark and I slid home with the winning run.” If only vicariously, through the eyes of Mickey Rawlings, I finally get to be a big-league ballplayer.